Although nearly 100 species are found in the dogwood family (Cornaceae), only a few varieties are used in home landscaping. The two most popular dogwoods are the Flowering dogwood (Cornus florida) and Kousa dogwood (Cornus kousa), which is sometimes referred to as Asian dogwood. Cornus florida is the old standby, being the most commonly recognized and usually the most readily available for purchase, of the dogwood trees to be found at your local garden center. The tree thrives in almost all areas of the eastern United States, and is known for its showy white, or sometimes pink or red, springtime blossoms. The tree does well in full sun or partial shade, and will actually adjust its shape and form to adapt to whatever conditions of light it finds itself growing in. A flowering dogwood grown in full sun tends to develop a more upright shape, holding its branches closer in to the main stem, while one grown under shady conditions will assume more of a spreading habit allowing its branches and leaves to develop out over a wider area in order to capture more light for its photosynthetic activities. The smooth, dark-brown bark of the young dogwood tree will break up into small scaly blocks as the tree grows and matures. The flowering dogwood is rather slow growing and is a welcome addition to the home landscape right from the start, with its colorful spring blooms and dark-green oval leaves that turn to a showy crimson red in the fall. Cornus kousa has gained more popularity over the last few years, particularly because of its resistance to dogwood anthracnose, which can weaken or kill a tree over a period of time if left untreated. 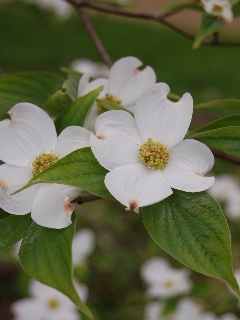 The Kousa dogwood tends to have leaves that are a bit smaller than the leaves of the flowering dogwood; also, the blossoms appear a little bit later in the spring and are somewhat smaller, with the white petals having a slightly greenish appearance. The Kousa dogwood is somewhat more drought tolerant than the flowering dogwood. However, all the dogwoods are rather shallow rooted and will suffer if periods of hot dry weather prevail. Keep a close eye on your dogwood trees in the drier spells of weather; if the leaves start to turn a paler shade of green or start to curl up on the tips, bring out the water hose and be very generous and frequent with your irrigation. 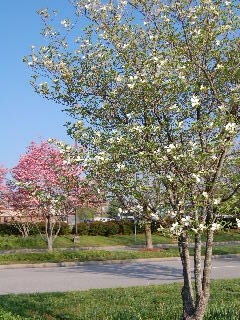 Both the Kousa and the flowering dogwoods can grow in excess of 25 feet in height, though usually remaining smaller. They make great stand-alone specimen trees or can be worked nicely into landscaped bed areas, serving as a contrasting taller plant in balance to your lower growing shrubs and flowers. A smaller tree, Tartarian dogwood (Cornus alba), can sometimes be found and makes a striking addition to your landscape. The plant is actually a deciduous shrub, only reaching 6-10 feet in height; it has small yellowish-white flowers in the spring and bright red branches that are showy in the winter. Whichever variety you choose, dogwood trees are great additions to your home landscape.